my great grill & patio MAKEOVER! Plus...a pre-Memorial Day/Cinco de Mayo par-tay! My family loves to spend time outside playing, listening to music, splashing around on the slip 'n slide, or just sitting and reading a book...and when we had a gas grill (more on that later) we would cook out a couple of times every week. We also love to entertain during the warmer months. Every Memorial Day we have a bbq of some kind or another...it's become a tradition. But enjoying the outdoors and summer entertaining is infinitely harder to do when you have no patio furniture (more on that, too)...in fact, the pre-Memorial Day/Cinco de Mayo party we were hosting this past weekend was scheduled to take place indoors...no matter the weather...because we just didn't have anywhere for anyone to sit outside. The patio is a disgrace...wouldn't you agree? Yes, it definitely needs some work. And, up until a few days ago, I had resigned myself to the fact this spring/summer would be spent either indoors or on the front porch...the back porch was going to remain neglected. And then I thought, you know what? ENOUGH of this nonsense!..it was time for a PATIO & GRILL MAKEOVER! After all, we did have a full 30 hours before our friends were due to arrive for our little get-together...that's more than enough time, right? 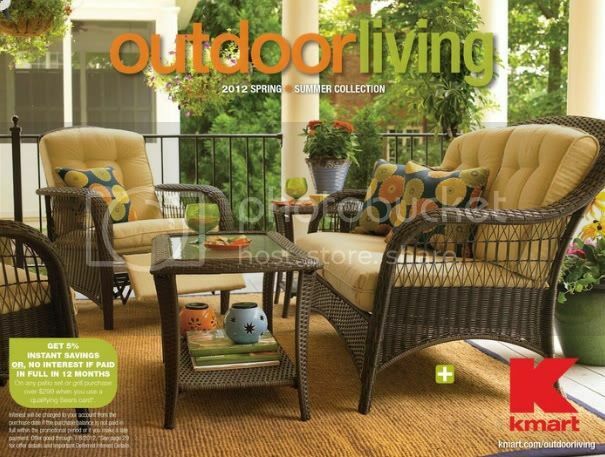 Thank goodness for the folks at #KmartOutdoor and their amazing new Outdoor Living collection! Picking out our new furniture and grill could not have been easier...Kmart has this amazing system where you can purchase your items online and pick them up at the store in just a few hours! And, with Kmart's "Grill Finder," you just click on your personal grill criteria, and the site shows you what's available! Cool, huh? I was also able to pick out some of my favorite accessories, add them to my cart, and have them available for pickup, too! I picked out a whole set-up, right down to some pillows for the chairs, and a grill. The next morning, I got the older kids ready and out the door, dropped Ty off at preschool, and checked my phone...and there was a text from Kmart...letting my know me order was all set and ready to be picked up! Awesome! So I drove right down the road to my local Kmart, popped inside and checked in at the Customer Service desk. In a matter of minutes I had my purchases loaded in my car and I was on my way...and it was only 9:20 am...still a little over 24 hours until "go-time." After running those errands I came home and got to work...first trimming the big bushes behind the patio, then re-edging & mulching the ground underneath them. Then I was able to start the fun part...assembling the furniture & grill and arranging all of my new accessories. Doug came home early from work and was able to help with the furniture...and then he and Gray put the grill together Saturday morning. Eeeek! I'm so stinkin' excited about this space! I have been so into bright yellow this spring! And these pillows from the #KmartOutdoor collection fit the bill perfectly! I just love this view! And here's our new super-awesome Char-Broil grill! A strawberry plant that already has little baby strawberries! Check out my new firepit...oh. yes. Aren't those napkins from Sandra Lee's new collection for Kmart so awesome? I love the bright color! My friend, Michelle, is the best Mexican-food-maker EVER...ever. Shop Your Way Rewards members save more each and every season and for every $1 you spend you get 10 points...how awesome is that? You can lock in today’s low prices for all of your upcoming events with Kmart Layaway! So...what do you think? Did we do OK? DISCLOSURE: I am a member of the Collective Bias™ Social Fabric® Community. This shop has been compensated as part of a social shopper insights study for Collective Bias™. #CBias #SocialFabric All opinons are my own...thank you so much to Kmart & Collective Bias/Social Fabric for this opportunity...it was a blast! Oh...my...word!! That is totally fantastic!! I love the before video and your makeover is AH-MAZING!! Can I come over for your next party? OMG! That is SOOOO FAB! I love it! so when are we invited over? I want to try those margarita push pops and sit by the fire pit! Great job! Oh geez Maggie will you puh-lease come and do something with MY backyard??? It's gorgeous and I'm jealous. Oh my gosh are you kidding? Everything looks amazing! I love the lanterns & the rug & the grill! Oh & the fire pit! Wow, I totally want the whole thing right now. Omg!!!! Maggie! This is so awesome!!!! I am blown away by this post!! You really went above and beyond and we are so appreciative!!!! OMG Girl that is AWESOME!! I would be out there all the time! Great place for blogging too! It is beautiful! I LOVE it! Kmart is fabulous! Everything looks amazing, loving the before and after! The Margarita Pop Ups, checking out now! You are fabulous!!!! Simply stellar job!!!! Maggie, it looks amazing! It looks like such a cozy outdoor living space. I love what you chose! WOW! Your backyard looks amazing. I love how it all turned out. Awesome post. Gorgeous -- Awesome and all that. It looks great - so inviting. Plus it looked like everyone else likes it too! What an incredible transformation...and in only 1 day! It's awesome, Maggie! Now if only this miserable weather we're having would cooperate. Come on summer!!! It looks wonderful and super cozy! I love it!! Everything looks great! I am digging that fire pit! Thousand percent better! Love the furniture and accessories you chose!!! I would LOVE a patio set with an umbrella! So fun! Hey girl, you have any more room on that credit card to get me a few things? lol. Wow, how did you get all that awesome stuff in your car with the kids too? Happy for you. That's what summer time is for, enjoying your family and friends on that patio. I'll live vicariously thru you ok? What are margarita push-pops and where do you get them? Are they really margarita flavored with booze or? Looks like SO much fun!!! I am loving your makeover.. :) That Mexican food looks SO good! It looks absolutely amazing. Awesome, girl! So funny that we chose the same set for this shoppertunity!! LOVE what you did! Awesome photos! Beautiful job! I love the before and after photos! What an awesome makeover-I love all the new patio things you bought!! Wow! Amazing transformation. Love the set you collected and the extra little touches you added. Great job. So Lovely! And I want one of those push pops! @srpprcrftr Yay! Thanks so so much! Yes, those push-pops are AMAZING...just like little frozen margaritas...booze and all...just click the link in the post and you will be taken to Amy Atlas' site where you can find the recipe...yum! holy cow girlfriend! this is amazing times 10!!! Look at all the amazing things you got--I would have never guessed it all came from KMart! LOVE those lanterns and seriously everything about your new patio makeover! I'm coming to your Memorial Day party. Just so you know. Looks great! What was in the Alfalfa Bags (they're white & leaning up against a tree I think)? Also you had a bush in one of the baskets - is it going to grow to big for the basket? I'm always afraid to do a bush/tree - would love to but I think with our cold here (Nebraska) it would die.... Beautiful patio though!